Gary is an artist in many media. 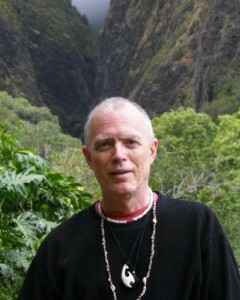 Gary has trained and practiced the following modalities: Lomilomi (Hawaiian traditional) bodywork, transformational movement therapy, spiritual direction and ritual procedures (both ancestral and modern), improvisation, and the arts of sacred intimacy (restoring and expanding the old pact between sexuality and spirituality). Gary has earned the ability and the consecration to perform Lomilomi bodywork along with it’s protocols. Lomilomi is a bodywork that raises the frequency wave in the body, and sheds levels of patterning to open portals of exchange between body, heart/mind and spirit. His Lomilomi lineage is through Wayne Kealohi Powell, Susan Floyd, and Kahu Abraham Kawaii. In addition, his consecration to remain in this work as a faithful witness to it’s essence is graciously affirmed by Kahu Lawrence Aki and Kahu Pilipo Solitorio of Halawa, Molokai. Additionally, when requested, he directs growth and process work through the skill of transformational movement therapy (in the lineage of Blanche Evan, Peter Geiler, and Joyce Izumi). He has earned a Master’s degree in counseling and theological studies from Seattle University, and completed a three-year professional training in Movement Therapy at the Institute for Transformational Movement.